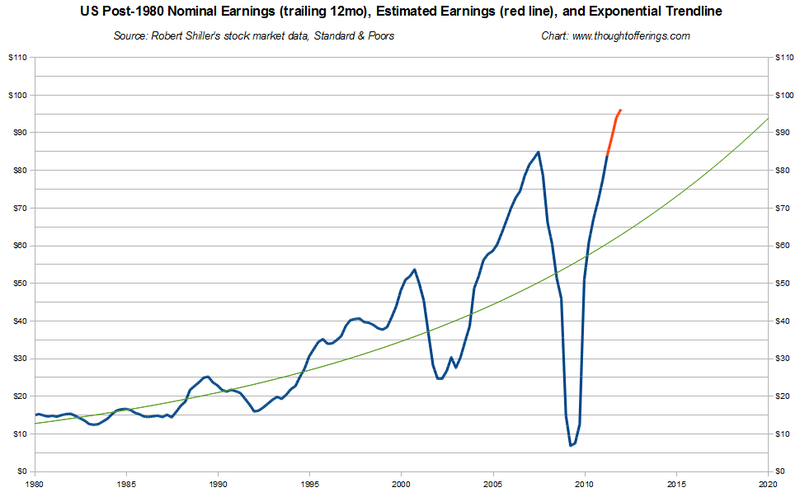 Thought Offerings: Stock Market Earnings Trends: What Happens This Decade? I'm very naive about all of this and appologies if I'm stating the obvious but over the last decade profits seem to have been distributed to shareholders not via sustained increases in share prices nor via dividends but via price volatility. If the SP500 were to never again pay a dividend and the price were to alternately half and double (ie remain the same over the long run)then investors could still receive returns if they constantly rebalanced their portfolios. If rather than just having equities that halved then doubled in price, the investor had 50% equities and 50% cash kept rebalanced, then they would get a compounded 6% annual return instead of the 0% return of the 100% equities investor. Rebalancing with asset classes that have a negative corelation etc accentuates that effect. It seems to me that a greater and greater proportion of profit distribution will be via this route because it favours the sophisticated investors (with the latest high frequency trading machines etc) and those are the people who control the markets. ThoughtOfferings, I was meaning the benefits of rebalancing non-correlated assets (or even better negatively correlated assets). Holding 50% cash and 50% stocks at all times entails selling stocks as the price increases (otherwise you would end up with >50% stocks)and buying them as the price decreases. That could be a totally automatic process done with no regard to perceptions of whether or not stocks were overvalued or market sentiment or any other market timing attempts. The consequence of rebalancing is to reduce the volatility of the total portfolio value. Imagine an investor has $10k in stocks and $10k in cash. The market crashes and she is left with $5k in stocks and $10k in cash. She rebalances to have $7.5k in stocks and $7.5k in cash. The maket doubles and she has $15k in stocks and $7.5k in cash. She rebalances to have $11.25k in stocks and $11.25k in cash. If she had instead kept all $20k as stocks she would have $20k in total at the end rather than $22.5k. ThoughtOfferings,I agree that if companies never issued any new stock and never conducted share buybacks, then halving and doubling of prices would just redistribute wealth away from some shareholders to other shareholders. However I thought in practice SP500 companies issue huge amounts of new shares (via employee stock options etc), conduct share buybacks and mergers and aquisitions. Isn't that how the SP500 distributed trillions of USD to shareholders during the 2000-2010 decade when someone holding a SP500 tracker and not rebalancing would have made a total return loss? I guess I thought that the only way to harvest such distributions was via active trading and that sophisticated ultra low latency trading systems get the bulk of it. Thanks for explaining what you meant by your diversification/re-balancing scenario, it makes complete sense to me now. And yes, as you note in your follow up comment, I had been focusing on the economy-wide macro outcome, whereas you were talking in terms of an individual investor strategy. As for the question of "how the SP500 distributed trillions of USD to shareholders during the 2000-2010 decade"... as I understand it, there are two sources of actual return to investors: dividends, and capital gains (increases in share valuations). You already excluded dividends in your example. and a flat market means share valuations overall didn't actually increase. More nuisanced return mechanisms are beyond me, but again, I'm not a market pro. When companies issue new shares, etc, if it is to finance actual investment, that can increase their earnings. A successful result usually gets reflected in dividends and/or share prices. It has become more common to buy back shares instead of paying (or increasing) dividends. 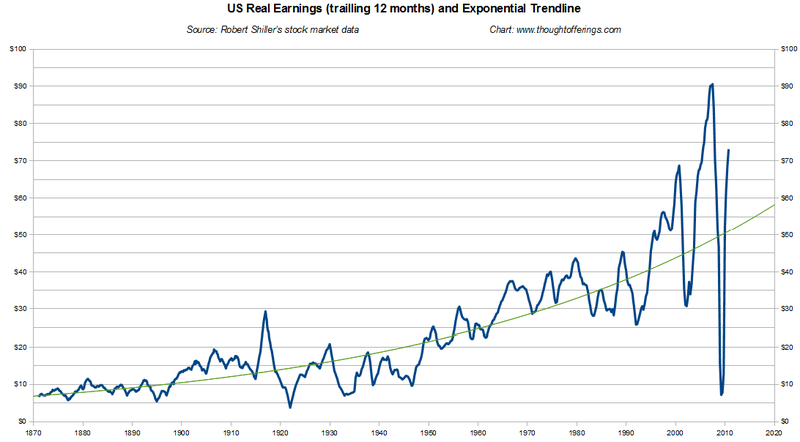 That doesn't do anything to OVERALL earnings or market capitalization, but it can increase earnings PER SHARE and price per share, simply by reducing the outstanding shares. 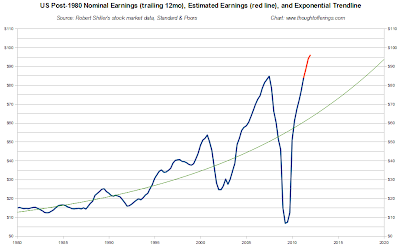 But from what I can tell the other measures of corporate profits such as national accounts data show just as steep a rise in earnings (see my post that followed this one), without relying on per-share data like S&P500 earnings. Still, that difference might be worth looking into further. hbl, I think most extra share issuance has nothing to do with funding investment. I thought that once companies regain the 2007 price peak, over a trillion USD of employee stock options will convert into new shares (as managment compensation). Every tracker fund will have to buy new shares in each company as and when those new shares are issued and sell shares in those companies that are not yet so overvalued :). hbl, what realy strikes me is that ultra low latency equity traders are the first customers of any advance in computor software or hardware. If an investor (or index fund) wants to own say 0.01% of Google, then they have to buy and sell shares so as to keep up with new share issuance and buybacks. Every action or inaction is exploited by extremely sophisticated competing investors over a micro-second timescale. Grasping all of this seems to me key to comprehending what is going on. When you say "More nuisanced return mechanisms are beyond me, but again, I'm not a market pro", I think that the certanty about SP500 returns over the coming decade is that they will be distributed via nuisanced return mechanisms to market pros :). I have to stress I'm talking from the position of a wholy ignorant onlooker. hbl I do think that individual investor strategy has major macro implications. If say %70 of shares are owned by people saving for pensions and 30% by investment banks and hedgefunds and all of the returns accrue to the employees of the investment banks and hedgefunds, then that creates a very different macro economy to one where returns were distributed in proportion to share ownership (such as via dividends). hbl, I guess my general point was that it is possible to envisage that over the coming decades the SP500 will remain rangebound under the year 2000 peak, no appreciable dividends will be paid and yet there will be a net outflow of trillions of USD to shareholders with a few of the shareholders reaping the vast bulk of that outflow and many shareholders actually making a loss. It used to be true that a long term buy and hold strategy led to recouping a share of the earnings of the companies owned. In principle and probably now in practice that need no longer be true. hbl, about issuing new shares- I guess if a company overall issues more shares than it subsequently buys back or if it issues shares at a higher price than it subsequently buys them back, then it is collecting money from investors to invest in the company. By contrast if it issues shares when the price is lower than when it buys them back, then the company is distributing earnings to the shareholders overall (but leaving buy and hold investors by the wayside). There is probably a great deal of interesting discussion to be had on the topics you raise, but I'm afraid I'm probably not the best equipped to have it right now, sorry! I think you are correct that there is a select group that extract outsized rewards from the financial system and probably will continue to do so, regardless of what the market does overall. This may be captured in trading fees, extracting a portion of the spread of every trade in the case of market makers (isn't that basically akin to a micro-sized capital gain? ), etc.